The Nebraska Game and Parks Commission has joined Pheasants Forever, Inc. (PF), the Nebraska Environmental Trust, the U.S. Department of Agriculture (USDA), Natural Resource Districts (NRDs), hunters, anglers, landowners, private organizations and government agencies to deliver an access program designed to enhance wildlife habitat and increase hunting, fishing and trapping opportunities throughout the state. 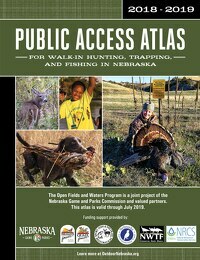 This Public Access Atlas identifies and consolidates these access areas on public and private lands into one easy-to-read atlas specifically for hunters, trappers and anglers. Printed copies of the Public Access Atlas are available at most sporting goods stores and Game and Parks offices, or you can request a copy be mailed to you. However, for the most accurate, up-to-date information, we recommend you view the atlas online. Please note that for a variety of reasons, the Public Access Atlas can change anytime. Those changes might not be reflected here immediately, though we work hard to make updates as soon as possible. If you encounter a sign-in page requiring user name and password, please clear your browsing history and access the page again. If you experience further problems, please contact our maps team. View a digital version of the printed Public Access Atlas. Unlike the printed book, map sheets are updated in this flipbook as changes occur. View Public Access Atlas sites within Google Earth by using our KMZ files. Start by downloading Google Earth and our KMZ files below. Then import the KMZ files into Google Earth to view sites. Users can get driving directions to specific sites, import GPS data, set placemarkers on properties and more. 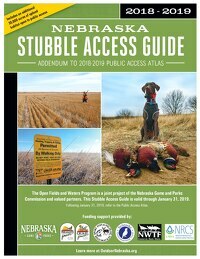 The Stubble Access Guide, published annually, details wheat and milo fields open to public hunting access. Tall, undisturbed stubble has been shown to provide multiple wildlife benefits to pheasants, quail and other wildlife from the end of summer through winter, and these areas are often underutilized by hunters.